We extended the application period from 16th to 25th of may. 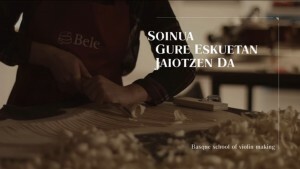 Application period to access the Basque Violin Making School BELE will be from the 15th of April to the 16th 25th of may, both included. Entrance examination will be on one single day, at the Basque Violin Making School BELE, the 17th of June 2016. Depending on the number of inscriptions there can be more than one date of entrance exams. Provisional results by the 22nd of June, definite results by the 29th of June.